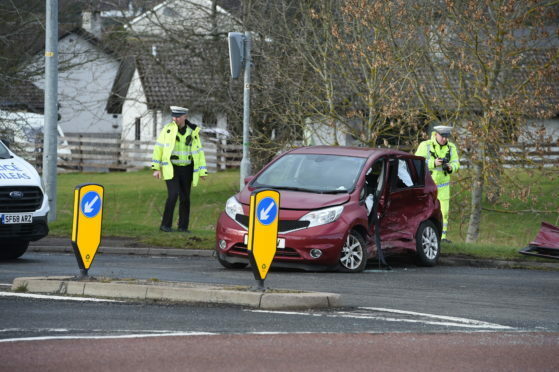 An 86-year-old woman has died after being involved in a crash near Conon Bridge. Valerie Taylor, 86, from Contin in Ross-shire, died in hospital on Saturday morning. The crash took place on the Tore to Dingwall stretch of the A835 where the B9163 diverts towards Conon Bridge on Wednesday. Mrs Taylor was the front seat passenger in a red Nissan Note, which was being driven by her 86-year-old husband, David, who remains in hospital. The Nissan had been travelling south on the A835 before it was involved in a collision with a black Peugeot 207. Emergency services were called shortly before 10.50am. Mr Taylor suffered serious but non-life threatening injuries. The occupants of the Peugeot were uninjured. Road Policing Sergeant Donnie Mackinnon said: “Our thoughts remain with the family and friends of Mrs Taylor at this difficult time. “The family would like to thank the emergency services and hospital staff within Raigmore Hospital for their help and kind words. “Our investigation into the collision is ongoing and I would like to pass on our gratitude to everyone who has already assisted with our inquires. At the time of the crash, officers appealed for anyone who may have had dashcam footage of the vehicles or witnessed the collision to get in touch. As a result of the collision, emergency services personnel closed the road in both directions for around four hours, with diversions put in place to accompany passing motorists. Two fire crews from Dingwall were tasked to the scene where hydraulic cutting equipment was used to free one of the casualties involved. Anyone with information can contact police by calling 101.